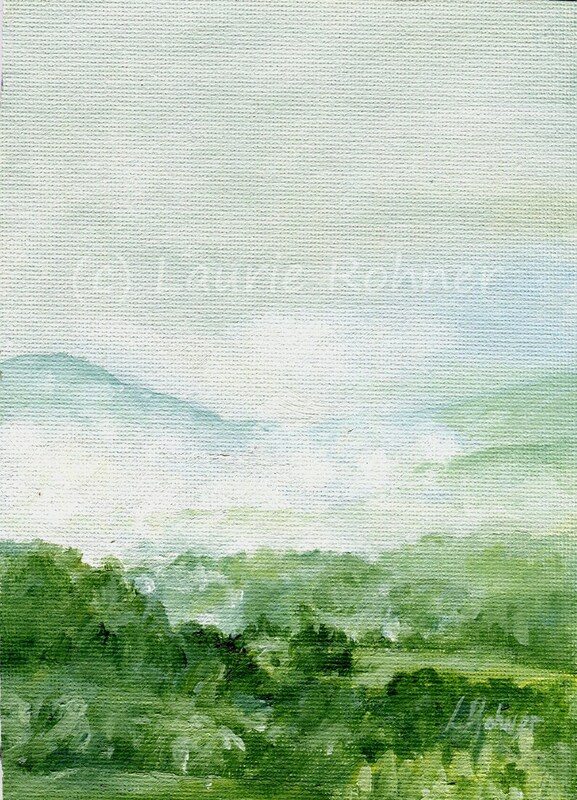 Foggy Day Vermont Landscape Original Oil Painting by Laurie Rohner Recently Added. A foggy day in Vermont is an original landscape realism oil painting on board/panel by Laurie Rohner. One of the amazing things that happen in the valleys of the Green Mountains is how the fog will settle in the niches and crevices, shimmering etheric and mystical. This painting is from my front window while living in Jeffersonville, VT.
Signature on the front, on back title date and signature. Painting is varnished and ready to be framed. Carefully packed for shipping with a Certificate of Authenticity enclosed. Ask about a frame for this artwork in black or white. Bird in an apple tree surrounded with golden yellow apples is painted in watercolor on a special primed canvas panel for watercolor artwork. 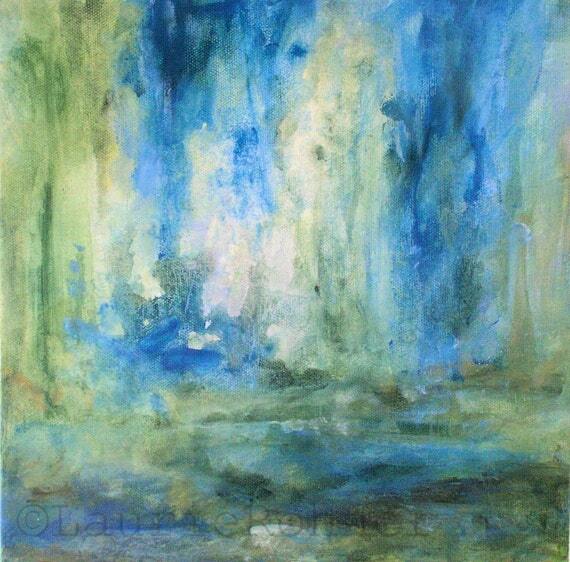 This original watercolor landscape is rich in greens yellows and soft blues. The bird is a simple brown bird, maybe a finch or sparrow, checking out the apples. Which one should I munch on. The apples are yellow red and green and make a great contrast against the green leaves. You see a hint of the sky. This painting is a realist Impressionist style painting. Want to buy this watercolor? Please go to my website here and buy. A detailed original oil painting on canvas with garden flowers in a spectacular array of color is painted in an impressionist style. Blue hydrangea and purple larkspur, pink coneflower and lavender, a stand out white hydrangea blossom set the show. What a pretty flower landscape painting with blue skies and nature on display. Comes unframed with staples on the painted sides but you can still hang without a frame. The painting will fit in standard 11 x 14-inch frame. Interested in purchasing this Impressionist style floral garden flower painting at Laurie Rohner Studio Here. Delicate detailed watercolor of garden wildflowers is ready to go. A large watercolor of garden flowers and wildflowers in a detailed nature botanical floral painting. Find red poppy and pink coneflower, some blue and yellow wildflowers, thistle, dill and sweet pea. I even added a bee. There are so many wonderful detailed hand drawn and painted flowers in my garden flower medley illustration. The watercolor is on 140 lb watercolor paper and I used high quality watercolors and ink to create this watercolor painting. This painting just simply makes you feel good. Take in a breathe and smell the flowers. Hang it in the nursery, give it as a gift or keep it for yourself. Great price for an original watercolor. Need help with framing I can help! The painting comes rolled in tube. Botanical floral watercolor garden art is available in my shop at Etsy-Between The Weeds. A detailed delicate botanical floral watercolor of pink blue purple garden flowers. The garden flowers in this original painting are spiderwort, phlox, indigo, monkshood, bee balm and veronica. Always a delight in any garden. Enjoy the square shape of the painting. Makes a great wall art addition for home bath nursery or give to Mom this mother’s day or as a housewarming gift. Signature: Laurie Rohner on front; title date and signed en verso. This original watercolor is on 140lb watercolor paper and I use the finest watercolor paints to create my artwork. Busy launching a new site. Check out Whitefield Studio. New is my print work offered on tapestries, shower curtains, throw pillows for inside and outside, mugs, clocks and tech accessories are a few of the products with my artwork. I also offer my art as prints on paper or canvas with framing options. Visit Here. Totes shower curtains and wall tapestries plus more. All my print work originates from my original watercolor oil and acrylic paintings. I like to depict nature with realism and whimsy with botanical garden flowers, woodland enchanted wood and woodland birds or creatures. I am in awe of nature and she is forever teaching me more with her beauty and magic. You could never be in a bad mood sitting under a tree in nature. Nature illustrations draw by hand on custom crafted furniture with flowers or animals using my new decorative watercolor painting techniques for furniture. I have painted garden pots and wooden totes for the garden lovers, fairy wish wooden keepsake boxes and handcrafted painted storage boxes and whimsical woodland necklaces handmade from nature too. 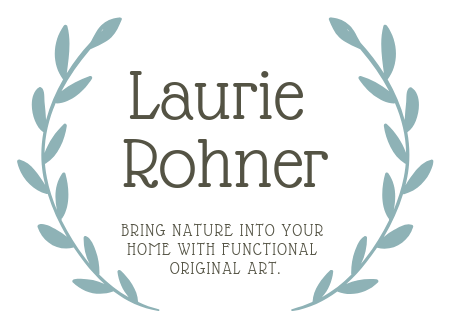 Original paintings and hand painted furniture with flowers hand painted designs are always at Laurie Rohner Studio. Check out more of my work HERE. What is new at Between The Weeds? Pet portraits. Have a portrait painted of your loved pet. I am working on paintings for the studio. This is so exciting. I am now working on pet portraits. I am having a blast. The house smells with oil paints and the creative energy is soaring. I really can say I have never met an animal I did not like. Humans too many but dogs cats pigs sheep cows horses lion and tigers and bears, oh my, never ever. Recently I had this amazing person pop into my life and instantly liked her. She lives with a menagerie of animals secretly I am jealous because I would love to live surrounded by furry feathered friends. I do draw a line with reptiles, especially snakes. She told me she had just lost her dog. The love she had for her dog beamed out from every pore and you could also feel the sadness. I was immediately touched and knew I would have to do something. I had been frustrated with my shop and what I was doing with my art. I had toyed with the idea to start painting pet portraits again. The next time I saw this new found friend I mentioned about my interest in getting back to painting pets and would she like one in memory of her dog? One thing led to another and I am working on a portrait. But to get the muscle exercised I worked first on a smaller portrait of a very special guy in my life. His name was Woody, or Sweet Woodruff his pedigree name. Woody was my spirit dog. He always could tell what I was thinking and there was not a day he did not give me all the love and joy he could muster. This is a 10 x 10 inch stretched canvas original oil painting I did from a photo of Woody. I chose to use blues purples highlighted with orange, yellow and light blue. To create the depth I used Paynes Gray with a touch of Umber and Ultramarine Blue. What gives this portrait the emotion and spirit is the eye (or eyes). I start with the eyes and work the rest in from there. The painting is finished with detailing around the eye (s) and highlights were needed. This is a close up of the face. Would you like a portrait painted of you pet? Various sizes can be done in many mediums. I am now working on oil paintings and pricing is flexible depending on the subject. How it works is simple. You supply a favorite photo showing your animal and half of the agreed amount of painting. Add a brief story about your pet and I will paint a painting. About 3/4 through the painting I will send you a shot of the work in progress for your approval. Once OK’d I will add the detail work and make any adjustments. When it is finished and waiting to dry so I can varnish the painting you send the last payment. The painting is shipped to you ready to hang along with your photos (if you sent them by snail mail). New pet portraits being painted at Laurie Rohner Studio. Please contact me and lets talk. Watercolor on board landscape of the shore line with a hint of the ocean beyond and sea grasses. This nature art painting is titled Summer Days. The clouds and sky are a mix of storm and blue sky. Remember those days at the shore when you cannot figure out rain or shine? The sun shines down in one spot illuminating part of the shore. Image and Board size: 10 x 16 inches. Signature date and tile en verso. Explore, Dream, Discover nature art illustrations. Paper Type: Arches 300lb hot pressed watercolor rag paper. Signature: LR on the front, tile, signed, date, on verso. You can see this and more nature art illustrations at Between The Weeds Shop for Laurie Rohner Studio. The fluid flow of this abstract nature art acrylic painting is serene blissful illusion. I painted it in shades of creams and brilliant blue with dashes of leafy lime greens and navy blue layers blended subtly. This is my version of what spring is with rain showers and waterfalls bringing forth the crisp green of grasses and leaves. This painting is titled ‘Spring’ hand painted by Laurie Rohner. Palette: cream,cobalt blue,cadmium green, denim blue, white, yellow, umber. Signature: Laurie Rohner on front, title signed date on enclosed card in back. 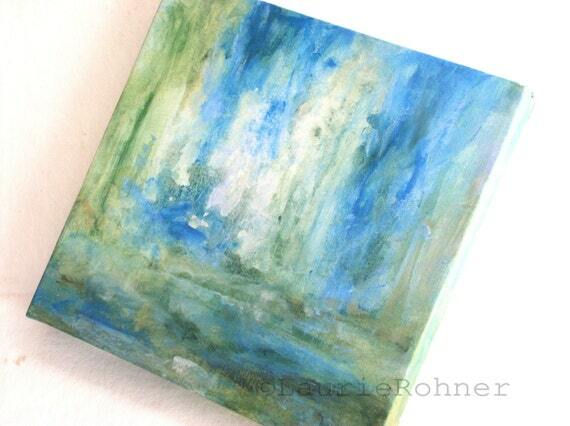 The painting measures is on a gallery wrap canvas (1.25″ deep) with staples on the back. This painting is beautiful color and a great finish from high quality acrylic paints. The staple-free sides of the canvas are painted. The edges are a continuation of the painting. The painting is varnished. Ready to hang or perch on a shelf or small easel. Your painting is then safely packed and shipped via Priority Mail.